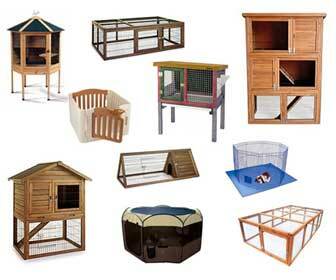 We are an online picture library of outdoor rabbit hutch homes and playpens. We don't sell anything or recommend any one product over another. We simply search out the internet and post the products we find along with basic information (if available) to help someone find it. What makes our site helpful? Unlike retail sites that are limited to showing only the products they sell, we are able to post EVERYTHING we find and show it. This allows someone to see a variety of competing products side by side without investing hours of search time or knowing all the relevant keywords to search out. Why don't we show pricing or give links to more retail sites? Prices tend to be a moving target, continually changing. Our goal is not to find and report the best pricing or promote one business web site over another, but rather to show consumers the numerous competing products that are available to them - before they make a buying decision. We do, however, offer links to Amazon.com, when available, for two reasons. Amazon offers a huge variety of products with pricing and reviews. It's a quick way for someone to find out more about a particular product and get additional information. The second reason is that Amazon pays us a small commission when an Amazon purchase is made. We use that to help keep this site going. Do you truly show everything that's available on the web? No, but we have fun trying. There are too many manufacturers, web sites and products that come and go to provide real time, product availability. There will be products 'out there' that we've not yet posted and products we have yet to find. Several of the products we've pictured may no longer be available for purchase. We do keep them posted, however, to show what has been done and, hopefully, to inspire creativity in those looking for inspiration to innovate new products. Why all the Google ads? The ads displayed, like the ones to the right, are all chosen by Google and are "supposed" to be relevant to rabbits. As such, the ads should offer useful information about companies who offer products of interest. Part of what keeps this site going is revenue generated when those ads are clicked. However, please do not click on any ad unless you have a genuine interest or curiosity about what's being offered. Can you help me find a particular item? Unfortunately, not at this time. All the information we have about a particular rabbit hutch or bunny playpen is posted along with the picture. We don't maintain a readily available database of websites that offer certain products. Have a question or site suggestion, send us an email. We'd be glad to hear from you!